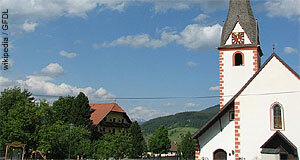 St. Margarethen is a village in the Lungau area of Salzburg, in the south-eastern most part of the province. The name of the village is made more specific by calling it "im Lungau" to discriminate it from a St. Margarethen in the Burgenland in eastern Austria. The Lungau St. Margarethen has a population of a mere 800. It ranks among the more touristy communities in the area, which is due to local skiing opportunities of the skiing area St. Margarethen - Aineck - Katschberg. In addition, several other skiing areas are within reach by public means of transport and even easier to get to by car. Otherwise, St. Margarethen also offers some good hiking opportunities and other possible Alpine summer sports. For hiking, note the many nice mountain cabins and the famous Alpine lake Prebersee. The village's surroundings are generally scenic and offer hiking tours at all degrees. In terms of sightseeing, note the local parish church and the general appeal of a small Alpine village. St. Margarethen is one of the communities in the Lungau where Samson processions are still done. Note also the nearby Schloss Moosham in Unternberg, one of the main attractions of the Lungau. St. Margarethen developed in an area that had been an important traffic hub in Roman times. The Romans built a road here in 210 AD and used it to tranport goods between today's Germany and Italy. The first parish church of St. Mararethen was built in 1231; it was extended in subsequent centuries. Modern tourism changed St. Margarethen, but relatively late: The first drag lifts were built in 1979.